Made in Hong Kong, c.1980. Microcomputer, comprising the keyboard unit with 16K ROM, power suppy pack, manual and seven original advertising brochures. 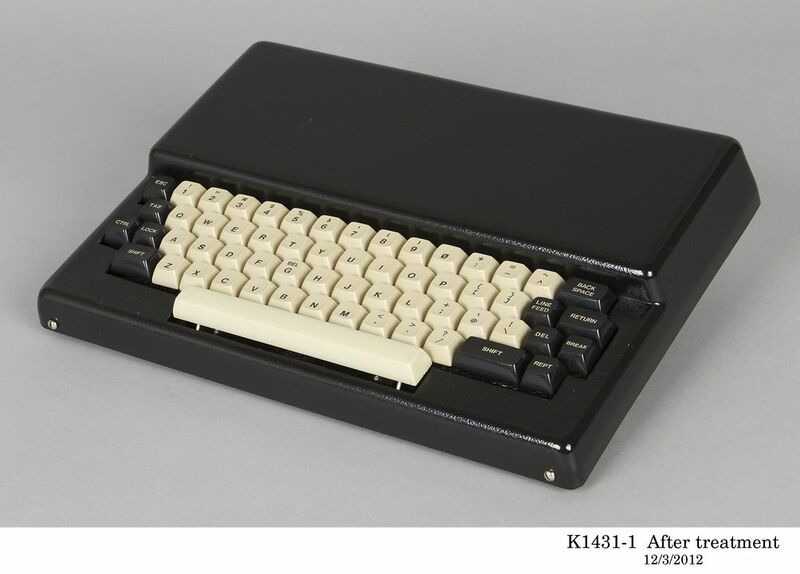 The keyboard is a long, flat, rectangular unit, black moulded plastic housing with a standard QWERTY alphanumeric keyboard, the keys are in black and grey plastic. At the back of the unit is a series of multi pin jacks for the power supply unit, cassette, visual display unit or monitor, printer and/or modem.There is a hole in the casing through which the circuit boards can be seen. The power supply unit is a heavy, black plastic box, rectangular, with a metal plaque on the top surface printed with manufacturer's details (see marks in part record). There are power leads coming from both ends of the unit: at the bottom a black domestic power cord; at the top a grey cable that separates into four leads with a round multi-pin plug and three single-pin plugs in grey, red and blue. Instruction manual for assembly and use of the Microbee. Original promotion brochure for the Microbee microcomputer. This computer was manufactured in Australia by Applied Technologies Pty Ltd in Hornsby NSW. The power supply unit was manufactured in Hong Kong. The "Microbee" was originally sold in kit form.